Projects consumed the morning on the 4th of July. Not feeling very festive for so many reasons that I will not discuss in my blog. On the docket this morning was a shohin Japanese Black Pine and a client Boxwood. After participating in an on-line training session about shohin black pines last night I was inspire to change my young tree. I never liked the top and the trees was too “open”, to much negative space between the branches for this size of tree. I placed some structural wire on the trunk and used a new technique to compress the truck and lowered the entire top area of the tree. I did the needle pruning to set it up for the second flush of growth going into Fall. 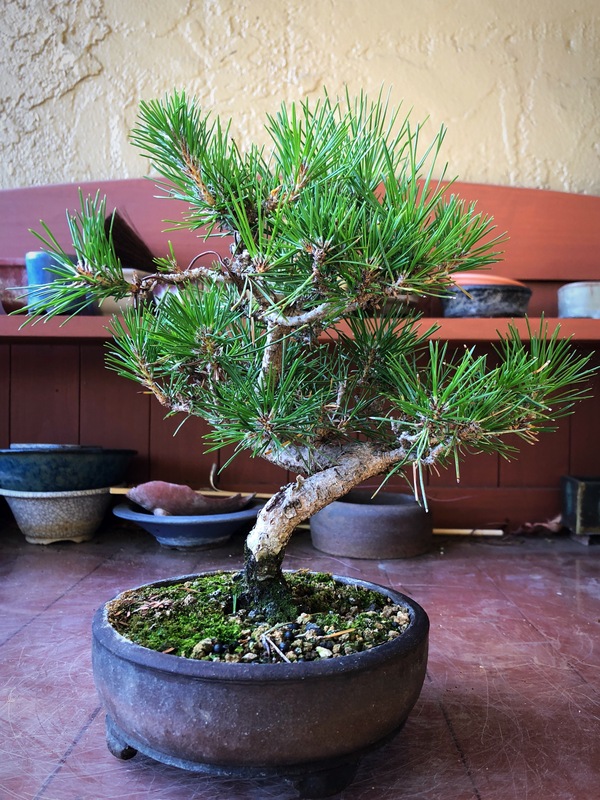 Shohin black pines are the last to be worked on in the season because we want small needles and short inter-nodes. The new compressed trunk allowed to shape the apex now and get more movement in the tree. So much work for this little beauty. My shohin black pine before needle pruning and wiring. 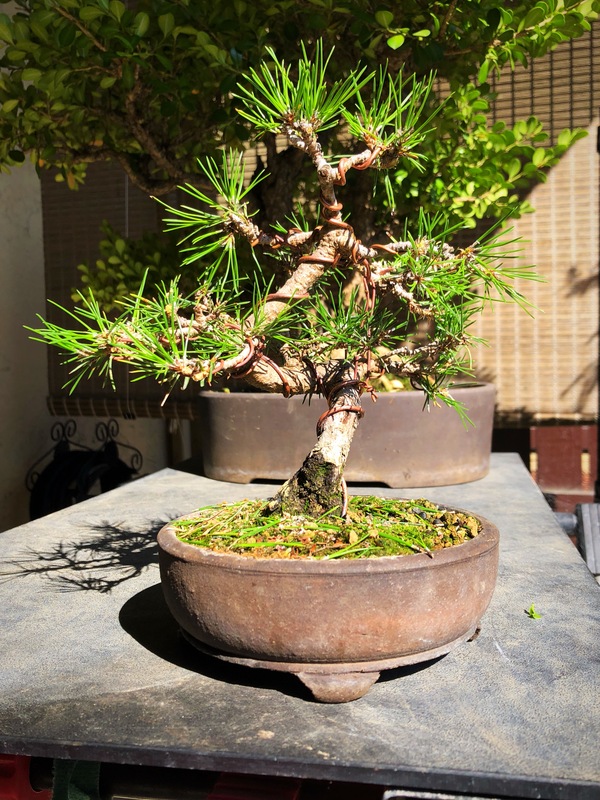 My shohin black pine after trunk compression, wiring, and needle pruning. The second tree was a client boxwood. It had been ast re-potted 8 years ago. The foliage was becoming yellow and showing distress and now wonder. 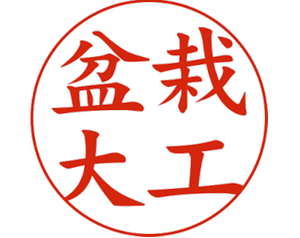 The entire pot was consumed with roots and became pot-bound. There was hardly any soil left to hold nutrients. I reduced the canopy of the tree to where dormant buds were sitting. I have found long ago that re-potting a boxwood in the summer is preferable to Fall/Winter as they do not sulk but quickly activate buds and root growth. Every boxwood I have ever worked on in the off-season or seen others do, failed to develop that year. So this one is re-potted in the summer and after-care become very important. It CANNOT go out in to the hot afternoon sun. It will stay in my garden for a bit while it recovers and then moved into the least hot part of the client’s garden (morning sun – afternoon shade). 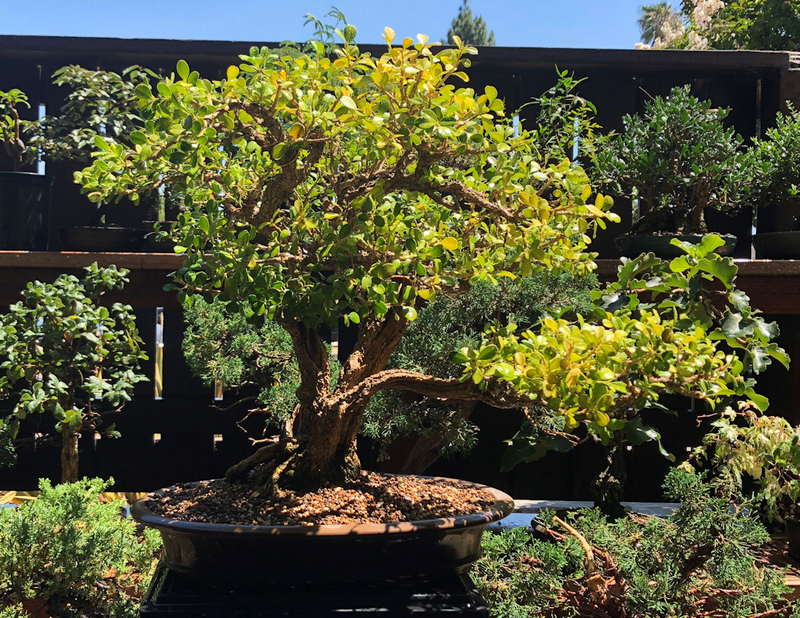 Client Boxwood: Leaves were becoming yellow and tree was over-grown. 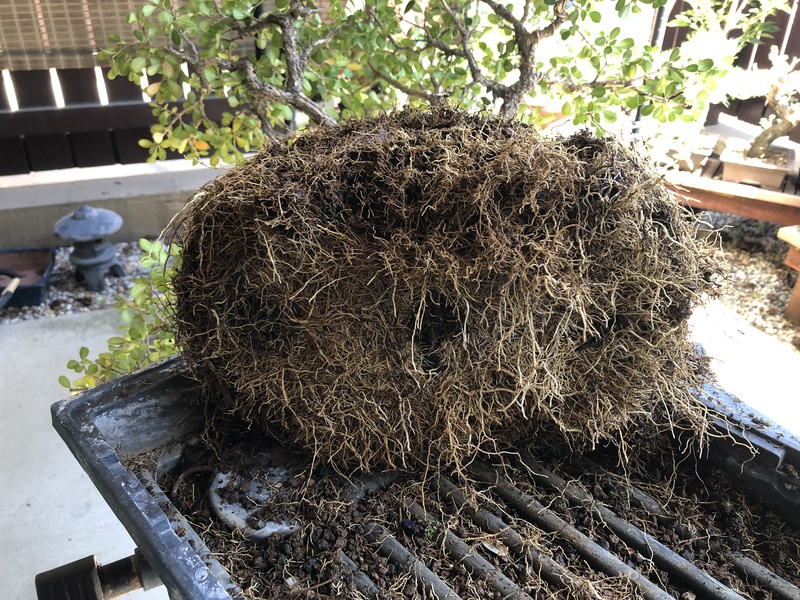 Client Boxwood: root ball after 8 years had become pot-bound, hardly any soil remained. 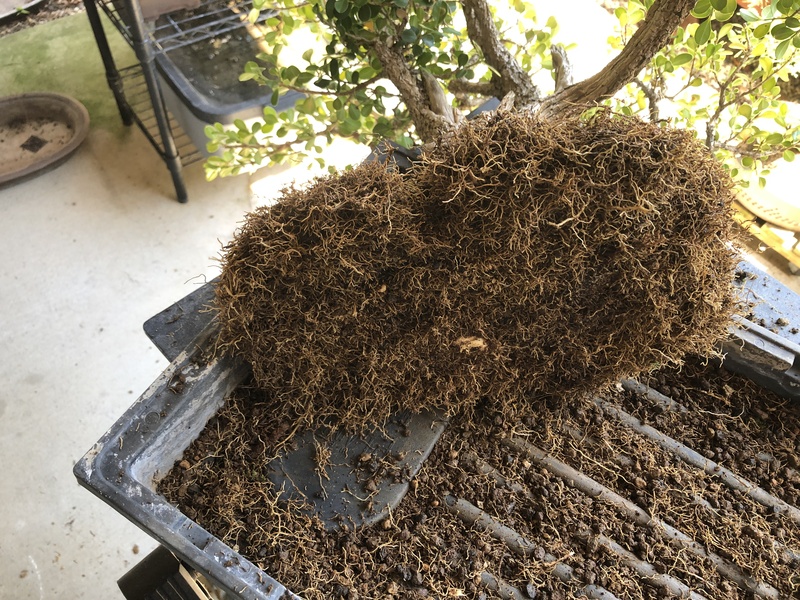 Client Boxwood root ball after root pruning begins. 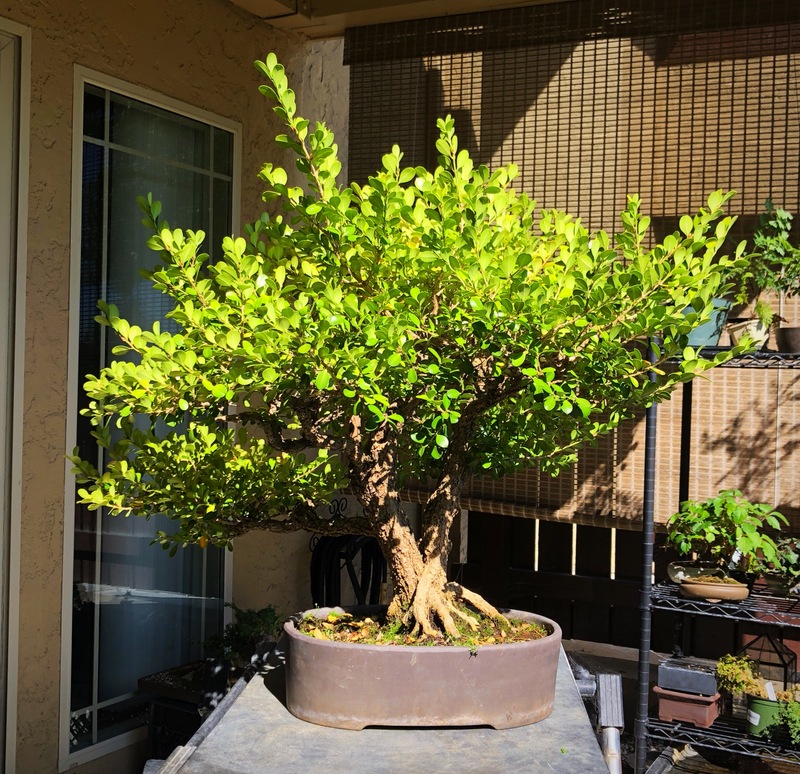 Client Boxwood after pruning and re-potting. It is is a new pot and makes the tree look so much more present. The previous pot was too heavy.